Join Tangled Roots Herbal in supporting our local Artists! We have lots of talented Artists joining us on Saturday's throughout this Holiday Season. They will be setting up and selling their work in our downstairs space. Joining us this week is Artist, Colby Lynch! My name is Colby. Art is what I do, and it's slowly making it's way all over New England. Canada's next, but I need a passport! Oh yeah, the art...I use quality materials in my work and make up my own designs. Each piece is a unique piece of art- In short, no "cloning" is done in my collection. 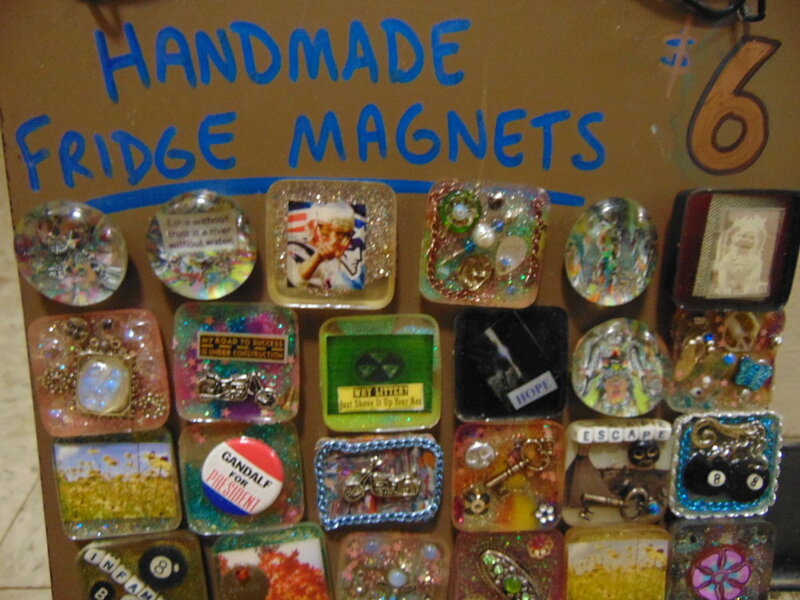 I started out with art many moons ago stringing beads in the park down in Charleston, SC. If you would have asked me at the time, I would have told you that I was a "renegade hippie traveler type" with no thoughts to clocks, schedules, or anyone telling me what to do. I used to get altered mentally to get into the "mood" to create. Needless to say, I lost a lot of friends and self-respect, and lots of cool art because of my choices at the time. In 2004 I cleaned up my act and started teaching art at a recovery center up here in NH. The spark of creativity had grown into a blaze by then, and I realized that the well is endless for anyone that wants to drink in inspiration. Our world is full of beauty everywhere, and I learned to reflect on uncomfortable things and believe that I would feel stronger, and one day would come that I wouldn't want alcohol anymore to help me feel "normal". Fast forward a few years, and I am now inventing new techniques and textures in my work all the time. 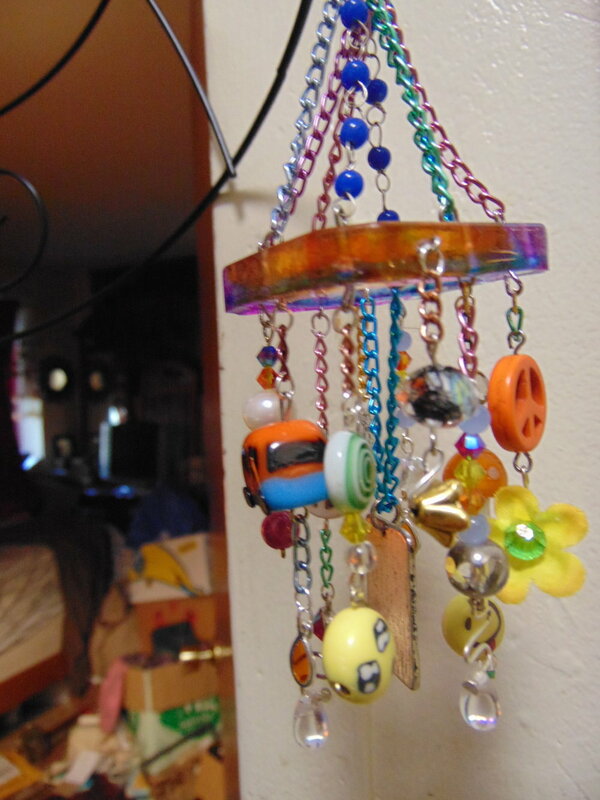 I invented the "windcharm", a mini mobile that can be used to decorate desks, lockers, rearview mirrors, sacred spaces, or wherever else one can think to hang a jangly, sparkly thing. No need to silence these with rubber bands when a phone call comes in. Unlike windchimes, they are not noise makers. My windcharms came into being when a "tent chandelier" was requested for a custom order. I call my latest works my "Beacons". They are portable lamps made of hand-dyed translucent polymer clay on glass with a resin cast. Beacons come in different sizes and shapes. Some are a box, others a lantern style or orb. They light up from underneath using battery-operated lights. The name came from an art and music festival, as beacons are a cool vantage point in a dark field, or a crowded dance floor where your friends can easily find you. Sometimes you find strangers too, who come just to see what the light is all about. That's ok. "Creations by Colby" is who I am online, and through the mail. "Beacons" is the name of my business when I take the pieces out of my creative space (my kitchen), and out into the world. This answers the question: What does art mean to me? In my life as an example..."Addiction spirals to darkness, Art is a beacon, a vehicle out of ruin"